We hope you enjoy this month's newsletter -- Running is a Mirror of our Lives. If you find this information helpful, please be kind and share it with your running friends! Running is a mirror of our lives because it can show us how well our lives are going. If our running is going well, chances are we are feeling really great about ourselves and how our lives are going. If we are struggling with running at the moment, then chances are the opposite is true. And these situations come and go in cycles, but what we most want to achieve and maintain is the first situation. We want to feel great about ourselves, our bodies, our running and our lives but how do we achieve this? Runners have a great advantage over the rest of the population. We have an easy outlet for all our stresses and frustrations with life. We can just go for a run and it solves so many problems for us. And we feel so much better after. This is what makes runners such great people to know!! We are used to dealing with stuff in our own way (leaving it on the run mostly) rather than taking our frustrations out on others. Runners can usually deal with issues and resolve them while running. Resolving issues and letting them go is one of life's greatest lessons. And life is one BIG continuous lesson! You must first see inside of you." Sometimes we think we have it all figured out and then BANG! We are back in a place of confusion and uncertainty again. Our great confidence is gone and we don't know why. The human psych can be difficult to understand sometimes. Then suddenly our running is not going as well as it was. We don't feel as energized and we have more aches and pains and maybe even develop an injury. 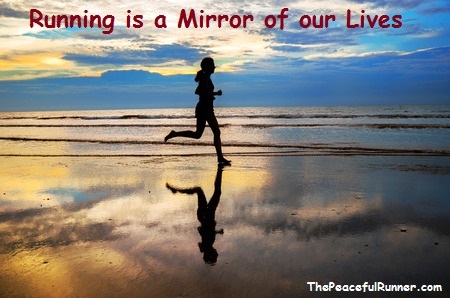 So our running often does reflect (like a mirror) how well our life is going at the moment. I have always found that affirmations help me when I am going through a period of doubt. They are great reminders of how much we really are in control of our lives. They help us develop confidence in ourselves and in the health of our bodies. This is why I developed the 10 Most Powerful Affirmation for Runners Program a few years ago. And I am amazed that I still use them from time to time. If I feel confused or lost with my emotions, they help bring me back to "myself." Recently, I was going through a low period. I developed a cold (my first one in years) and then I fell while running and hurt my knee. So I wasn't able to run for a few weeks. My self-defeating thoughts were getting the best of me during this time. I needed a firm reminder that I am still in control of my health and well-being. So I went back to the program and started using affirmation #3 and listening to the audio recordings again. It really helped me feel better and gain confidence in the health of my body again. My need to have my beliefs re-affirmed surprised me though because I thought that my belief was strong. However, over the years, I have come to realize that life is like an onion. As we continue to learn and grow from our experiences, there is always another layer waiting to challenge us. But each challenge helps us to progress and grow and brings us closer to our ultimate goal of achieving a truly peaceful, happy and pain-free life! Hmm...I would love to see how that life would look in the running mirror!